The natural cream contains zero chemical compounds such as synthetic surfactants or antioxidants, and zero artificial fragrances or coloring. 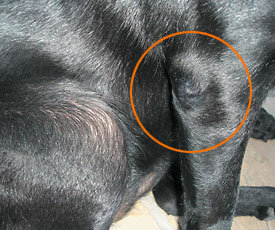 Licking the cream is not harmful to your dog or cat. –　Contains jojoba oil with excellent hydrating properties and squalane to lock in moisture on your pet’s coat. 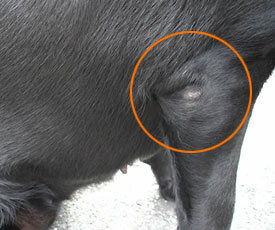 –　Restores moisture in your pet’s pads to prevent cracking. –　Rub in to retain moisture and relieve dry or atopic skin. –　Relieves dry, itchy skin. –　Adds moisture to your pet’s fur. –　Prevents toughening of the skin and the formation of calluses common on the foreleg knees. Natural Skin Care Cream Skin and fur protectant. 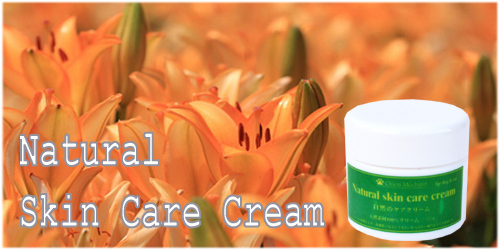 Natural Skin Care Cream for all dog and cat breeds. — For pads or other effected areas, apply a small amount and rub in well. — For calluses or tough skin, apply a slightly larger amount and rub in well. — For dogs with dry skin, rub the cream evenly between your (the owner’s) palms, then rub in well as if giving your dog a body massage. The prerequisite for all the products we develop is that they contain no chemical compounds such as preservatives. 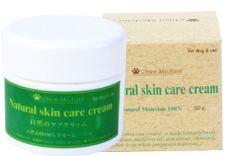 So it goes without saying that Chien Mechant Natural Skin Care Cream is also free of chemical additives.